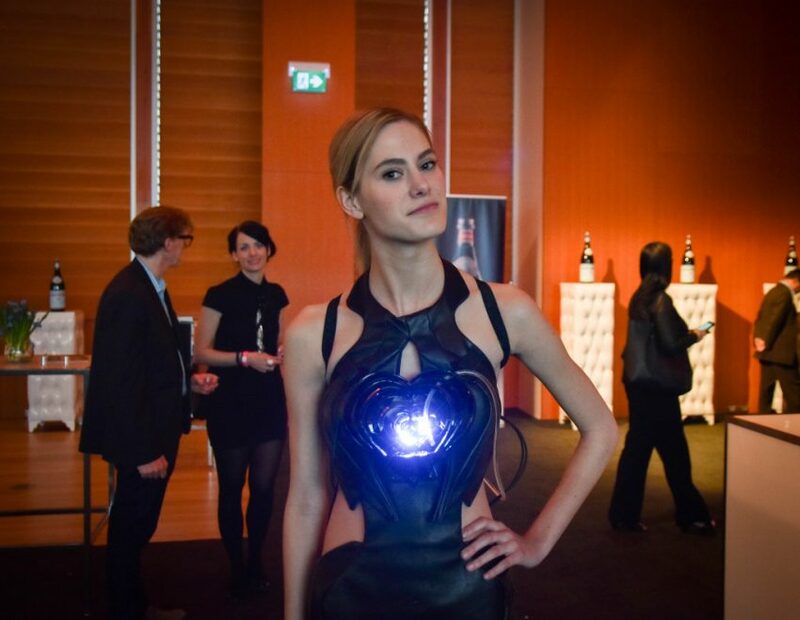 This Crazy Tech Dress is the Bartender at the Party #WearableWednesday « Adafruit Industries – Makers, hackers, artists, designers and engineers! Can you guess which awesome designer created this cocktail dress that serves up drinks? If you said Anouk Wipprecht, you just won a gin and tonic. I’m afraid you are going to have to DIY it, but seriously, this dress really did serve up gin and tonics at Ontario’s Terroir—a celebration of food, hospitality and creative influencers. It’s Anouk’s latest project called Drinkbot, and it’s all party on the front and business on the back, as I discovered on Electric Runway. The illuminated heart on the little black dress was done through selective laser sintering (SLS). You may wonder what inspired the heart design, and it turns out the dress was originally created for a special event for Cirque du Soleil’s Heart Ibiza. 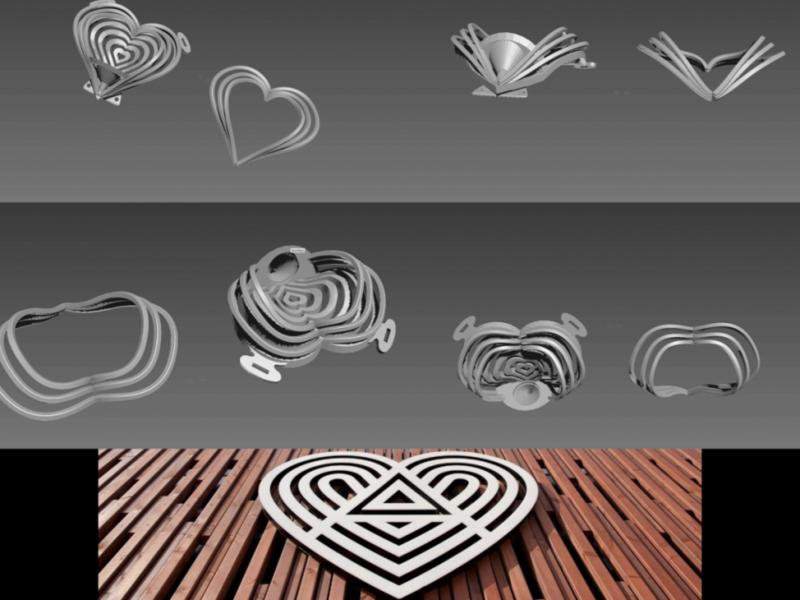 It reminds me of Celtic designs which have a woven beauty, only this heart neatly holds a shot glass. The reverse side of the dress includes a backpack to hold the drink ingredients and to handle the electronics. I almost find the back more intriguing as you can view the liquids moving through tubes like a dialysis machine. This was a more simplistic version of an earlier dress that Anouk collaborated on called DareDroid, which actually engaged the drinker in “Truth or Dare” in order to receive a drink. Although this dress lacks the gaming aspect, it is still a crowd pleaser. Thinking about how you might design your own drink serving wearable? 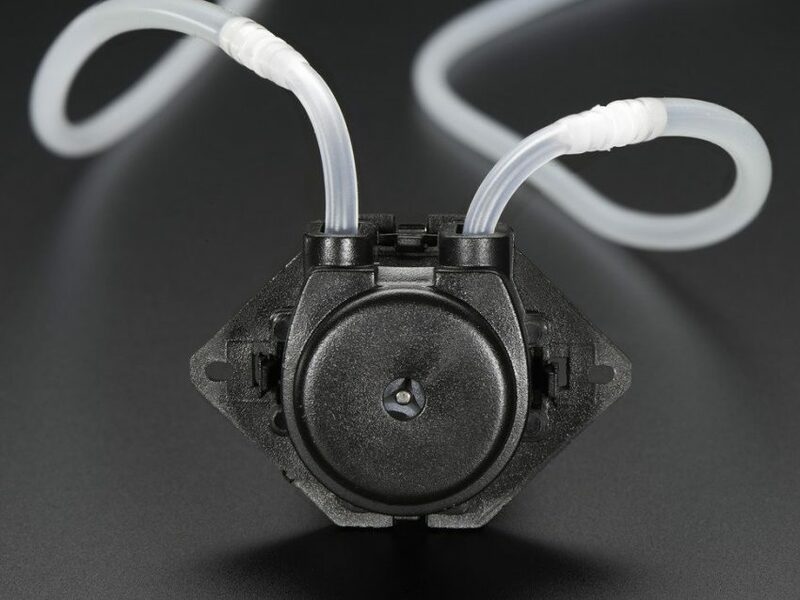 Check out our Peristaltic Liquid Pump. The pump never touches the fluid, so it’s a sanitary way to handle drinks, and it may just be the perfect part to get your creative juices flowing. I should mention there’s a vendor listed on our product page that specializes in food grade tubing, if you want to be OCD about all of this. So, know that you can get as serious as you want with your projects. What would you like to serve? I’m thinking an iced chai latte would be great right now. Making is crazy fun.